CORE Schools Economics Challenge 2018, in collaboration with the Financial Times: The winner is in! Home | Blog | CORE Schools Economics Challenge 2018, in collaboration with the Financial Times: The winner is in! Congratulations to The European School Karlsruhe, the winner of the CORE Schools Economics Challenge 2018, and especially to Ellen Gerisch (left) and Maria Assanbaev (right), who created the high-speed animation in the winning entry. 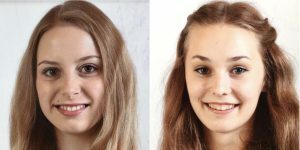 The European School Karlsruhe will receive £1,500, and Maria and Ellen will share £500 Amazon vouchers. In partnership with the Financial Times, we asked schools around the world to use The Economy and the FT’s site for secondary schools as a resource to create a three-minute video on the theme “Ten years on from the Global Financial Crisis”. The judges were pleased too, commenting that the video had “very high production quality” with a good use of humour, with “excellent style and good use of economic theory”, and was “continuously engaging”. The European School Karlsruhe was established in 1962 as one of 13 schools set up for the children of the personnel of European Institutions. Today it offers an education to children whose parents come from all backgrounds, and from European and non-European countries, and has German, French and English sections. It offers a distinctive multilingual and multicultural education that helps its students study international events, says Angela Starost, who teaches Economics and Human Science. “They study economics in English, but usually more than half their exams are in a foreign language. I can say to the students, can you follow the news in France? What are they saying about this in Venezuela? It makes for really good class discussions,” she says. This year participating schools were each permitted to enter a collaborative entry with another local school. The winner of the collaboration prize of £1,500, plus £500 Amazon vouchers for students, was the team from The Charter School North Dulwich and Dulwich College. The judges praised the entry’s “great ambition” and “excellent variety of interviews”. Congratulations also to Hills Grammar School, Sydney (video), and St Paul’s School, London (video) for their entries that placed second and third in the CORE Schools Economics Challenge 2018. Hills Grammar School wins £750, with £300 Amazon vouchers for students, and St Pauls wins £500 for the school and £200 in vouchers for students.